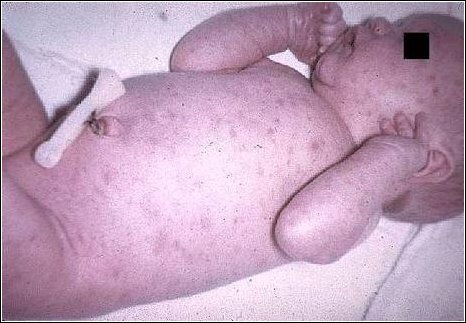 This infant has the rash of congenital rubella (German measles). These infants are at great risk for severe mental retardation, deafness, blindness (atrophic eyes, cataracts and chorioretinitis) as well as congenital heart disease and other abnormalities. This disease has been nearly eradicated in the United States as the result of routine rubella vaccine use, whereas in earlier years as many as 20,000 infants were severely affected in a given year.